On the evening of September 9, an exclusive interview of Raj Thackeray was telecast on ABP Mazha. A statement reveals that this interview was shot on September 6. The purpose for referring to the dates is a revelation made in the presence of Raj Thackeray himself, about a supposedly ‘threatening’ letter, never being sent by the Chief Secretary of Bihar. Using this letter as a ruse, Raj Thackeray had declared at a gathering of MNS officials held on August 31, in combative words that every Bihari in Maharashtra will be considered a squatter and driven away. Raj Thackerey says his ‘lie’ was based on a report published in the Samna [a newspaper run by the Shiv Sena] about a threat issued by the Chief Secretary of Bihar to the Mumbai Police that if the latter entered Bihar and arrested criminals there without a warrant, they would face charges of ‘kidnapping’. There is no need to ask why the makers of Samna resorted to such exaggeration. Samna’s expertise at creating a rift in society by spreading false news is well-known. Abhay Anand, the DGP of Bihar had written a letter to Sanjeev Dayal, his counterpart in Maharashtra, expressing his annoyance over the Crime Branch of Mumbai Police not informing local police in Bihar when arresting criminals there. There is nothing wrong with that. If, for any reason they do not want to inform the local police [in Bihar] in advance – considering the covert relations between the police and criminals – then there should be no issues with them informing the local police immediately after the arrest. Due to this, the Bihar police will not have to needlessly face the anger of the locals. By twisting this routine letter by the Bihar police and exaggerating it, Samna turned it into a threatening letter sent by the Chief Secretary of Bihar. Raj Thackeray then upheld the news and created a ruckus in the name of Biharis. The caper here is that his family publishes hanky-panky and he wastes words by holding it up. It is infuriating that almost all media gave a lot of publicity to Raj Thackeray’s statement and to the non-existent ‘threatening’ letter by the Chief Secretary of Bihar, without verifying anything (which they should have done). It is a relief that this matter ended where it did; otherwise it could have taken an ugly turn and led to loss of life and limb for the common Bihari (or non-Marathi) and Marathi. What gives for leaders? They instigate people for their selfish ends, and walk away. The uproar created by goons during a morcha by Raza Academy on August 11. The ready opportunity it created for arm-flexing by way of retaliation, the quick support offered to Raj Thackeray by Sonia’s Congress – which kept mum over the entire affair – because it put the Nationalist Congress Party in a spot, Aaba’s [RR Patil’s] political rivals in the NCP, and most important of all, RR Patil’s mismanaged modus operandi – the amalgamation of all of this benefitted Raj Thackeray who is always on his ego trips. Under the excuse of lifting the low morale (?) of the police, Raj Thackeray held a big morcha on August 21. He declared in the morcha that illegal Muslim migrants from Bangladesh were responsible for the violence on August 11, and displayed a Bangladeshi’s passport found at the site of violence as proof. 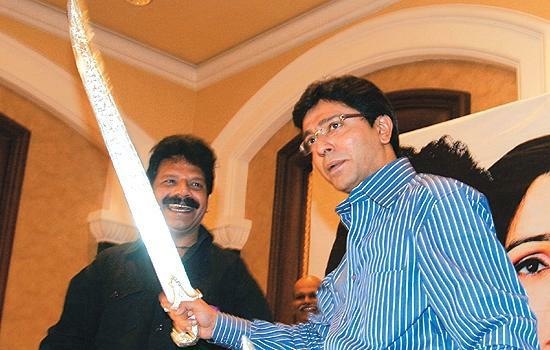 How does Raj Thackeray possess a passport found at the site of the violence in CST that took place on August 11? Whose passport is it? And why did the person who found the passport (Raj Thackeray definitely didn’t) send it to Raj Thackeray? From August 11 to 21, for 10 whole days why did Raj Thackeray keep the Bangladeshi’s passport with himself? If the morcha on August 21 had not taken place, would he have kept the passport with himself forever? Has Raj Thackeray directly or indirectly helped the Bangladeshi ‘rioter’ in escaping by not handing over the passport to the police? To this day, Raj Thackeray has the passport, which indicates the Bangladesh passport scandal is a publicity stunt, and that is why this incident becomes even more serious. However, all politicians and the media seem to have conveniently turned a blind eye to such a serious incident because this could be a part of their politics. But when the common people accept such an incident silently, then its danger increases manifold – because this game started by the leaders of hankering after vulgar publicity by making a hullaballoo of national security, and the greed for increasing their vote banks may surely backfire on them. However, the leaders are not concerned with that; they are cozy in their burrows, in the huddles of their bodyguards. Those who die and suffer are common people like you and me. “A statue of the Buddha was shown contempt in Lucknow, yet why are Dalit leaders silent? Why do they keep harping on in the Indu Mill?… Do they wish to construct a bungalow on the land?,” Raj Thackeray asked. Now, after banishing the workers of a mill that was closed down, only Raj Thackeray can tell how the land can be disposed off. So be it. By bashing up the Ambedkar-following young men and women who had gathered to protest against this unrestrained statement by Raj Thackeray, MN sainiks [workers of the MNS] have shown the spark of their ‘Maharashtra dharma’. Raj Thackeray, who cracked his knuckles because Dalit leaders did nothing after a Buddha statue was vandalised in Lucknow, made a blatant U-turn by saying in an interview with ABP Mazha, “Why are statues and memorials needed? The statues are vandalised, then riots happen”. Does Raj Thackeray not know why the statue of only one exemplary man is shown contempt for, even though there are statues of countless leaders in this country? The vandalism does not happen because the statues are, it happens because of the sick mentality to commit such vandalism. It seems that Raj Thackeray has conveniently forgotten that the mentality to show contempt for Babasaheb’s statue has thrived especially in his courtyard.